This particular gift guide is especially timely, considering I’m on the move today from Japan to Hong Kong. Not to mention Thanksgiving is next week! I honestly can’t believe it’s already here. This year has absolutely flown by! For those who like to go on longer adventures (like the one I’m on now), it would be thoughtful to gift them with a nice travel set of their favorite beauty products. For example, my travel-sized Oribe hair products go with me everywhere. The texturizing spray acts as a dry shampoo of sorts, adding grit and grip to your hair so that it holds curl, volume and looks better for longer. I also carry around the hairspray for days when I don’t want the wind messing up my ‘do. Finally, I also have the purple shampoo and conditioner so I can maintain my platinum blonde locks while on the go! These all make fab stocking stuffers too! For the beauty lovers, this travel mirror would make an excellent gift. It comes with a velvet case for packing, and features various magnifications for makeup application precision. For the fitness-minded, this little lightweight kit features a jump rope, resistance bands and booklet of workouts to keep you active abroad. Super easy to pack! 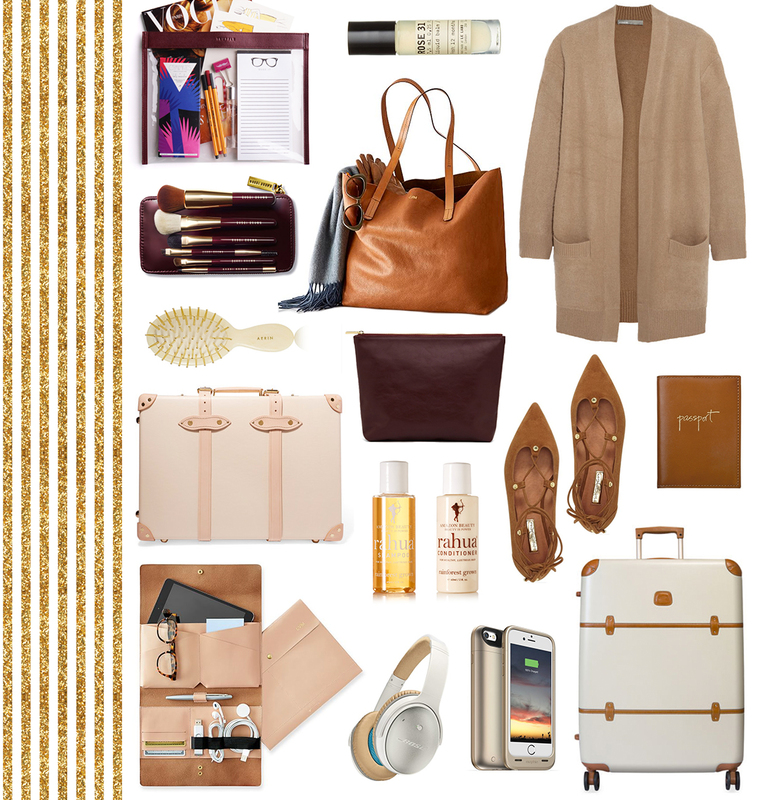 For those quick weekend trips, this leather weekender bag is a stunning travel staple. It comes in a variety of beautiful neutral shades, and works for guys and girls alike! I also love this somewhat more masculine shape. If you’re like me and HATE combining dirty and clean clothes in the same luggage, this laundry bag is a wonderful way to separate the fresh from the filthy. Perfect for those longer trips when you don’t have access to a washer/dryer! I love the Mark and Graham pouch! It’s so convenient to have everything in one place and organized too! Love the picks! Nice idea! That suitcase is amazing.